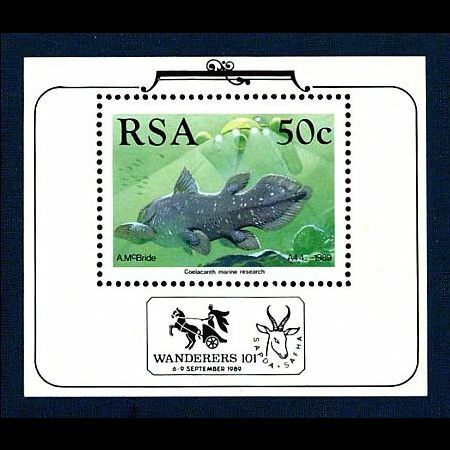 South Africa 1989 "Identification of the coelacanth 50 years ago"
Fifty years ago, on 20 February 1939, the stunning announcement was made that a Coelacanth had been caught off the Chalumna River mouth near East London (a city in RSA, see it's location on FDC cover). At that time, the Coelacanth was thought to be extinct for nearly 70 million years. The drama commenced on 22 December 1938, when Capt H Goosen, skipper of the trawler Nenrine, brought ashore a peculiar metallic-blue, heavily-scaledfish with fins resembling legs. Miss Marjorie Courtenay-Latimer, Curator o the East London Museum, was informed of the strangie catch, but was unable to identify the fish, which measured 1,5 m in length and weighed 57 kg. Alter it had been treated and mounted by a taxidermist, Mr R Center, a description and sketch were sent to Prof J L B Smith of hodes University, at Grahamstown. The description and sketch resembled palaeozoic fossils, also called Coelacanths, and alter detailed examination of the fish on 16 ebruary 1939, Prof Smith was able to declare that it was indeed a Coelacanth. As a tribute to Miss Courtenay-Latimer it was named Latimeria chalumnae. 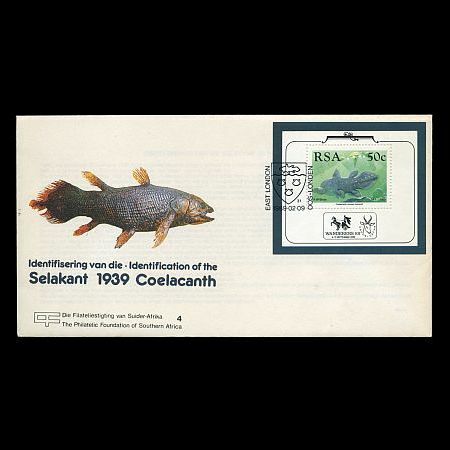 The discovery of the Coelacanth was described as the biological find of the century and the event was heralded with banner reports world-wide. Prof Smith's formal descriptions of the fish in the British joumal Nature and in Transactions of Royal Society of South Africa also aroused new scientific and other interest. The scientific significance of the Coelacanth lies in the fact that it is the longest surviving species of a group of fishes which became extinct millions of years ago. Furthermore, it is the closest living relative of Rhipidistia, which emerged from water onto land and which may have given rise to higher forms of life. The discovery allowed scientists to broaden available information which had previously been gleaned from fossils only. Prof Smith held the opinion that the sea near East London was not the normal habitat of the Coelancanth, but in fact the tropical westem Indian Ocean. After a search of 14 years together with his wife Margaret, a second Coelacanth was discovered off the Comoro Islands at the close of 1952. 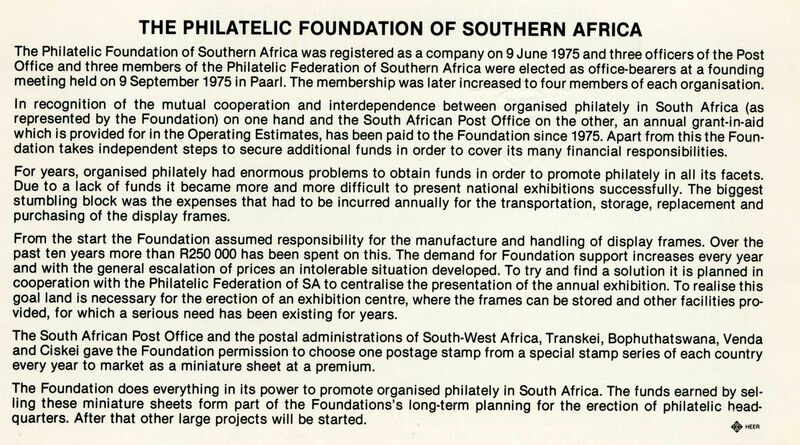 This was considered so important that the then Prime Minister, Dr D F Malan, made available a military aircraft to fetch the fish which is now on display at the JLB Smith Institute of Ichthyology in Grahamstown. More than 150 Coelancanths have since been caught off the Comores, but not anywhere else. They can be viewed in museums throug the world, including South Africa, where the original specimen is preserved in the East London Museum, the second specimen in Grahamstown and one each in Pretoria and Pietermaritzburg. After landing the third Coelacanth, Prof Smith published a book entitled "Old Fourlegs, The story of the Coelacanth". It has seen three English editions and was also published in nine other languages, including Russian and Japanese. 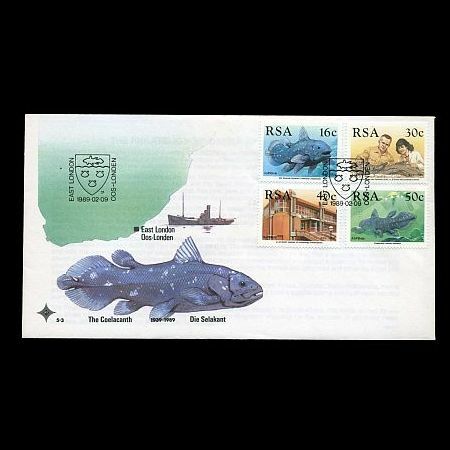 The 6c stamp depicts a live Coelacanth, Latimeria chalumnae, in its natural habitat. 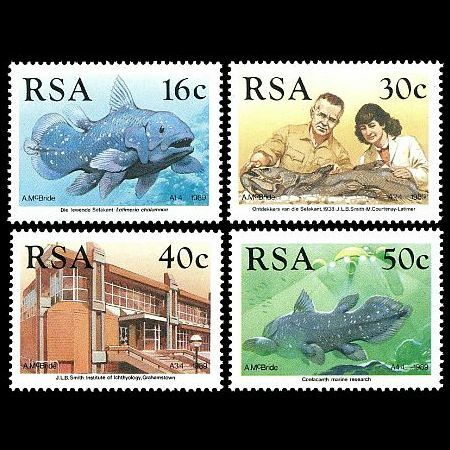 The 30c stamp portrays Prof J L B Smith and Dr Manorie Courtenay-Latimer with a Coelacanth. The 40c stamp. The Institute glays a leading role in marine fish research and in Coelacanth conservation. 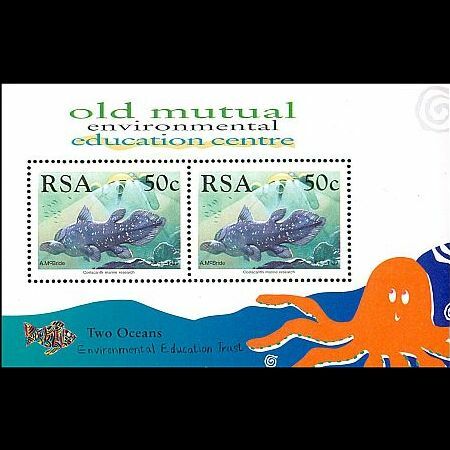 The 50c stamp features the GEO two-man submarine which is being used to study the livigg Coelacanth under water. Scientists are also investigating current conservation measures regarding the species because of possible threats to its survival.